Home › Home and Kitchen › Prepworks By Progressive Cheese Grate And Measure With Etched Stainless Steel..
Prepworks By Progressive Cheese Grate And Measure With Etched Stainless Steel..
Color:Red/yellow Progressive International is your source for the widest rangeof functional, inventive and fun kitchen tools and great ideas put intopractice. Our functional gadgets, tools, food-prep items and householdproducts make cooking and meal preparation more efficient and fun. AtProgressive, passion and creativity unite to create the right balance of formand function for today's cooks. Our in-house designers spend hours in thekitchen coming up with ways to improve on a variety of traditional tasks andtools. Established in 1973, our commitment to quality and service allows us tooffer a broad selection of quality kitchenware and other household products.Prep works products from Progressive International are created by people whounderstand having the correct kitchen tool can make your cooking experiencemore enjoyable. prep works -essential items for today's cook. We asked how wecould make the experience of grating better. We wanted to make a grater thatwas a good value for the consumer. We wanted one that was easy to control andfit our consumer's lifestyle. The result is S4. We have 4 simples objectivesfor our S4 graters: Sharp, Straight, Simple and Smart. Each Progressive S4etched stainless steel grating surface features our Progressive Internationalpatent pending design. The extra sharp grating surface grates and zestsfaster, smooth and straight, resulting in a higher output. The Progressivegrate and measure set includes a medium and fine blade, a snap lid and a 2-cupstorage container. The grater is comfortable to hold and easy to use with itsnon skid base. 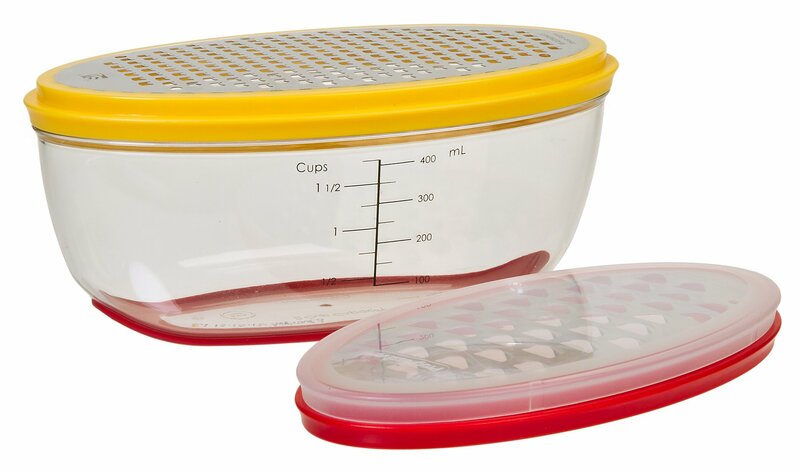 Grate into the clear container with measurements up to1-1/2-cup on the side of the container. The lid and graters snap together foreasy storage. The grater measures 7-inch by 3-1/2-inch and is dishwasher safe.